I am a doctor, “rejuvenating” corporate CEO, entrepreneur, author, and speaker. My wife (Jill), our three-year-old daughter (Joie), our golden retriever (Sunny) – and our soon-to-be-born second daughter (Jae) – live in Tampa Florida and Newport Beach California (we alternate locations every month – so we travel a lot). Please go to BeHappy101.com (or see the yellow box at the end of the newsletter) to provide your comments, suggestions, stories, or thoughts and I’ll respond to you personally – as appropriate - as soon as possible. Here’s to your happiness and to having the kind of life you want to have! Money and Happiness – are they related? The purpose of this newsletter is to provide a regular and consistent supplement to the action-oriented process in my website - www.behappy101.com - and in my first book, simply called BeHappy! 35% discount for newsletter subscribers! BIG DISCOUNT for newsletter subscribers. According to research, Americans earning 10 million dollars annually are only slightly happier than average Americans. Surveys indicate that the top 10 happiest countries in the world are: (1) Denmark, (2) Switzerland, (3) Austria, (4) Iceland, (5) The Bahamas, (6) Finland, (7) Sweden, (8) Bhutan, (9) Brunei, and (10) Canada. Money and Happiness: Are they related? Money is on many people’s mind these days. Our economy has been very “depressed” for the past year and most people are not “happy” about it. Many people are under financial “pressure” (some under significant pressure) – and so fear and anxiety are very prevalent in our lives right now. And as with many such issues, the news media just contributes to that anxiety. So that’s the primary focus of this edition of The BeHappy! Newsletter ... the relationship between money and your happiness - and a strategy for you to improve your outlook, and your situation. But it’s certainly a very complex issue. And this edition of the newsletter was tough for me to write because it’s hard to condense such a complex and multi-faceted topic into a relatively short newsletter article (in fact, I think I'm going to write a whole book on the subject). So for now, my plan is to start the discussion with this edition of the newsletter – then follow up with (a) additional strategies and concepts in future editions of the newsletter over the next year and (b) continue to add to the subject in the Money & Wealth section of the website. Part of the reason the topic is so complex and controversial is because money does not guarantee happiness. I'm sure you already know that - it's essentially a cliche. We all know of people who have lots of money, but are not happy and fulfilled in their lives. But that does not have to be the case. We can have money – even be wealthy – and be happy at the same time. And, as you'll see as you go through the rest of this edition of the newsletter, the opposite can also be true to a certain degree (in other words, people can be happy - perhaps very happy - even with relatively little money). But that's not the best possible scenario as you'll see in a minute. Certainly there are opposing views on this issue. Research shows, for example, that people at the poverty level are not as happy as people who are more “comfortable” financially. Also, information gathered from many years of study indicates that as income increases, so does happiness - although the increase in happiness is reduced dramatically once people get past a certain income level (around $100,000 annually). And, as the “Happiness Fact” at the beginning of this edition of the newsletter indicates, people who make 10 million dollars per year are only slightly happier than Americans with average income (but, they are happier). So my belief – and what I endorse throughout the BeHappy! system - is that money (or at least some of the things money can do for us) affects everyone’s happiness to some degree. That doesn’t mean it has to be our top priority or total focus in life (in fact, it shouldn't be), or that we can’t be happy if we are not wealthy (although that is the case for some people). The basic issue (and part of the strategy for addressing it) is that you must know a bit about yourself – and your neuro-associations about wealth - in order to be rich AND happy (if that's what you want). What do you believe about the relationship between money and happiness? What have you been taught? What is in your subconscious mind about money? Do you believe, for example, that rich people are greedy and/or bad? Is it that “money can’t buy happiness” (as many people say) or is it on the other end of the spectrum and more along the lines of ... “a large income is the best recipe for happiness” as stated by Jane Austen (the 18th century novelist)? In my book - BeHappy! - and on my website (www.behappy101.com) I suggest that the only way to live the happiest possible life (which is the goal of this whole BeHappy! “system”) is to first establish your own personal Definition of Happiness. If you don’t know your definition – and I mean really know it – you can’t be as happy as possible. This Definition of Happiness is different for everyone. It’s something each and every one of us must figure out for ourselves. And it is essential as a first step to being totally happy. That’s why it is the subject of the entire first chapter of my book. If your Definition of Happiness has little or nothing in it about money, then money will be less of a factor for you than for someone whose definition has a financial component. In fact, if money – or the things money can do for you – are part of your Definition of Happiness, (as it is in mine) you will likely not be as happy as possible (and may even be quite unhappy) if you don’t have a certain level of wealth. So, where are you on the "money and happiness" relationship spectrum? Are you someone who is happy - really happy - with just a roof over your head and enough food to eat (which, by the way, typically requires at least a little money); or are you the kind of person who wants enough money to be able to travel all over the world, buy a yacht, and have two or three luxury homes? Are you somewhere in between? Do you have a "wealth mindset" or is your "habit" one of scarcity? First, none of these beliefs and perspectives are "wrong". They are just different. It’s okay to want things – including expensive luxuries - as long as you have balance and a good perspective about it all. It's also fine to not want or need much. It just has to be consistent with your identity and your Definition of Happiness. So, consider your situation - and we'll get deeper into this in a few minutes in the "Action" section of the newsletter. Next, many times people "assume" money is not important to them and so they settle for only what they believe they can achieve (which are usually limiting beliefs). Some people even “pretend” they are as happy as they can be without money simply because they believe they will never have lots of it. So they compromise their lives based on their belief. These people, if they are totally honest with themselves, might have money as a larger part of their Definition of Happiness than they admit – to themselves or others. And if in reality they will truly never have lots of money (for whatever reason), then there are still many ways to be happier (for example, by using this BeHappy! system). And finally, it’s important to realize that nobody – except you – can make you rich and happy. My whole mission with the behappy101.com website is to help make that happen by providing you the tools you can use to make yourself happy (and rich - if that's what will help make you happier). Because no matter who you are, or what your circumstances are, you can be happier - and have more money if you want – all at the same time. I realize this topic of money and happiness can be touchy. But it can also be made quite simple. As Bo Derek once said, "People who say money can't buy happiness just don't know where to shop". Yes, I’m making a bit of a joke about it, but hey, I’m going to take every chance I get to put a smile on your face – even for just a second or two. So, if you have read previous editions of The BeHappy! Newsletter you know that every issue provides some simple action-oriented exercises for the next two months (until the next edition of the newsletter) which relate to the main subject of this edition - to help make happiness a habit. Just a few minutes of focus every day or two and you’ll be laying the foundation for the happiest possible life - both for yourself and for those you love. If you have never taken the time to consider - and write down – your own personal Definition of Happiness, do it now. Click on the "definition" link in the previous sentence to access a "primer" (summary) of the concept. 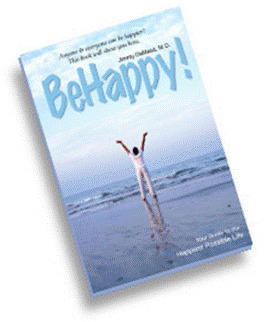 Go to Chapter One of BeHappy! for a comprehensive description of it and a series of exercises designed to help complete it. Whatever it takes, at the end of the process, you should have a written-out definition based on the “guidelines” provided in the "primer" for your definition. Don’t go on until you have done this part (even if it takes several days). If your Definition of Happiness has no direct mention of money, wealth, or material possessions – but does have some contributory components, material desires, and/or personal achievements requiring financial resources - then you should rate yourself in the “4” to “7” range. So, for example, if your Definition of Happiness contains some criteria such as “an ability to travel” or "raising happy, successful children", money will be more important to your happiness than those in the "1-3" group since travel typically requires money, and raising happy, successful children these days generally means providing them a good education and getting them involved in some extracurricular activities (like music or hockey or gymnastics) - which again, typically require additional money. In this case, if the person with these components in their Definition of Happiness did not have the money necessary to meet these criteria, they would likely not be totally happy. If money – and especially wealth - are a clear, specific part of your Definition of Happiness, you should be somewhere in the “8” to “10” range. It might be a "8" or "9", for example, if your Definition of Happiness states something like, “an ability to meet my financial obligations and have little or no debt” or “the means to save for a comfortable retirement”. It might be a “10” if you have a significant wealth component to your Definition. I, for example, would rate myself as a “10” because my personal Definition of Happiness contains financial freedom as one component (so there is a direct link, for me, between wealth and total happiness). IMPORTANT NOTE: This does NOT mean money has to be the most important thing in your life (even if you rated it a “10” for this purpose). It certainly isn't for me - even though it is a "10" as related to my Definition of Happiness. Since it is a clear and specific part of my Definition of Happiness, wealth (financial freedom) is essential for me to be totally happy. Certainly, however, and without question, my relationships with family and friends – especially my wife and baby daughter – are much more important than money and wealth. I could give everything "material" up in my life, and still be able to be very happy overall, with them in my life. I would be very unhappy without them in my life, regardless of my financial situation. See how complicated this gets? This is the kind of honest introspection you must go through in order to create a meaningful definition for yourself. Next, with your definition complete and your “rating” number identified, it’s time to spend the remainder of the next 60 days starting to create a plan based on the "gap" (if any) between that number and your current situation. For example, if you ended up with a rating of “8” as your score (meaning you have a specific financial component or goal involved in your Definition of Happiness) – and you are in significant debt, and/or can’t afford many luxury items, and/or have difficulty meeting your monthly financial obligations, and/or you are unemployed – then you need to have a plan to change the situation. You might need to use some (or all) of the strategies found in the Money & Wealth section of the behappy101.com website as a start. It’s important for everyone, for example, to create multiple streams of income. Also, it may be important to increase or augment your current income, find ways to reduce expenses, and/or get out of debt. Whatever it is, since there is a discrepancy between the degree to which money can make you happy and your financial situation, you must do something to change the situation. Creating a plan is the first step. Use the Happiness Plan template I’ve designed as a start. Also, make sure to read the series of articles called Overcoming Fear to Thrive in the Current Downward Economic Cycle. This series of articles provides specific strategies and tools to improve your outlook and your financial situation. It can even help make you wealthy. Use whatever resources you need, and for the next 60-days, just get this process started by doing some of these basic things to help you understand how money can affect your happiness. It will change your life. And in one or more of the next few editions of The BeHappy! Newsletter in October, December, and/or February, I will follow up with more actions to help you take the next step in the process and fine-tune the relationship between your financial situation and your happiness. It's all part of the BeHappy! system ... and it's all important. So make sure to take the actions described here. please click on the "DONATE" button below to make a contribution. The amount you give is entirely up to you, and would be greatly appreciated. A portion of the proceeds will used to contribute to the happiness of others. BeHappy! at Work free e-book: I’m giving away a free introductory (summary) e-book version of the book I’m writing to everyone who subscribes to this newsletter. Since you are already a subscriber, you will get a copy when it is released (hopefully in September). PLEASE tell your friends to subscribe so they’ll get a FREE copy, too. A new E-Coaching opportunity: get personal, private coaching from me - all electronically (by e-mail) with this new, effective part of the BeHappy! system. Friend-Connect on BeHappy101.com: A new "social networking" function I just added to the homepage. JOIN NOW if you haven't already and become part of a "happiness community" of friends. Several new articles on relationships and other life issues by The Neighborhood Shrink: a regular “clinical psychology” contributor to behappy101.com. A new "tour" component of the website is under construction, which is intended to help you get the most from the behappy101.com site on a regular basis (to be finished in September). This "tour" will provide you the ability to navigate the entire website easily based on whatever interests you - or whatever you need to be happier and more fulfilled. The popular Thought for Today: a feature on the site initiated February 1st which has provided a new thought every single day since then. Each new Thought for Today gets posted on the behappy101.com homepage every morning (365 days a year) around 5:00 a.m. (unless I sleep in – then it might be 6:00 a.m.). These are thoughts to help start your day off right. The thoughts are generally about happiness, success, relationships, money, etc. So go to the website everyday for a new “thought”. You’ll soon become “addicted” – and it will improve your life tremendously.